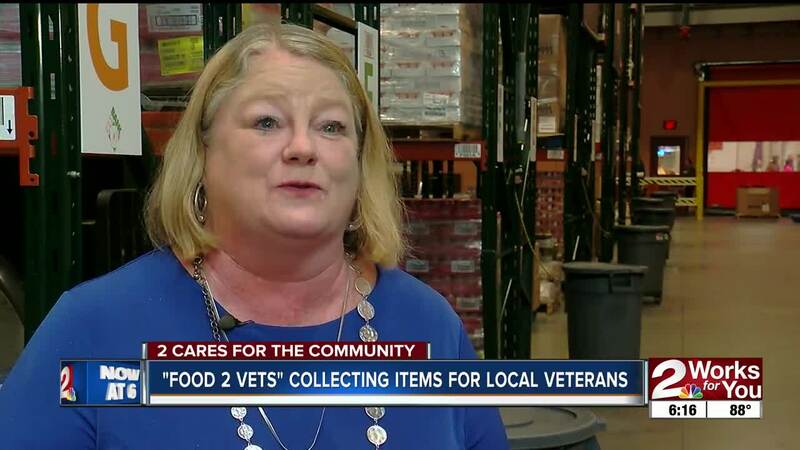 BROKEN ARROW, Okla.-- 2 Works for You is hosting a food drive to benefit veterans. Viewers can make donations at the Stoney Creek Hotel & Conference Center . The food collected will benefit local veterans’ charities, BRRX4Vets and The Coffee Bunker. 2 Works for You anchors, reporters and volunteers from Community Food Bank of Eastern Oklahoma , as well as other special guests, will be on location accepting donations on Wednesday, May 30, from 11 a.m. to 6:30 p.m. Stoney Creek Hotel & Conference Center is located east of Elm Place on Albany Street in Broken Arrow. "Stoney Creek is dedicated to supporting our community; especially our veterans,” says Jim Thompson, owner of Stoney Creek Hospitality. “We proudly support the sacrifice that these men and women have made to our freedom and we extend our appreciation of their services by joining with our local Oklahoma forces by supplying food to those in need." This is the third annual Food 2 Veterans food drive. During the 2017 veterans food drive, our community gave enough food and monetary donations to provide over 8,500 meals. The mission is to collect food for veterans throughout the area. Proceeds will benefit the Food Bank's veterans’ programs which include BRRX4Vets and The Coffee Bunker. 2 Works for You will be highlighting BRRX4Vets and The Coffee Bunker during news segments throughout the day.